The arrival of summer in Britain brings one thing to most of our minds – strawberries – but there’s plenty more to get excited about. Here are seven summer favourites from a collection of the UK’s best chefs and food writers. As British food lovers, we spend most of the year coveting Mediterranean climates and ingredients, gazing longingly over the channel at the greener pastures of the continent. Once a year though, we finally get the sun we’ve been longing for and we’re blessed with our own bounty of fresh, juicy, flavourful summer ingredients. Leading the charge in June is the famous British strawberry – although they’re not necessarily at their best until next month, strawberries in June are still delicious. Keep an eye out for raspberries and gooseberries too – the latter are hugely underrated and delicious in sweet and savoury dishes. That said, there’s so much more to British summer than strawberries. June is also the month for foragers to scour their local hedgerows for elderflower – the season only lasts about a month, but elderflower is easy to find and you can keep it all year round in the form of elderflower cordial. In fact, we have a handy guide on making your own elderflower cordial right here! Other stone fruits like apricots and nectarines really come into their own this month, and peaches will soon follow in July – look out for fruits with a little bit of give in the flesh when you’re buying, and don’t be afraid to ripen them at home for a couple of days before you use them! June is the time to be eating watermelon too – it’s more versatile than you might think, and as at home in a salad as it is in a dessert. Summer favourites like peas and broad beans are still just as good now as they were last month, as are leafy greens like watercress, sorrel and lettuce. It sometimes seems a shame to waste fresh greens in something as simple as a soup, but don’t be dissuaded – watercress and lettuce both make fantastic soups, or you can combine the two as Pascal Aussignac does in his lettuce and watercress velouté. Last but certainly not least, keep an eye out for mackerel and tuna in your local fishmongers – both have just come into season and will be at their peak flavour-wise. 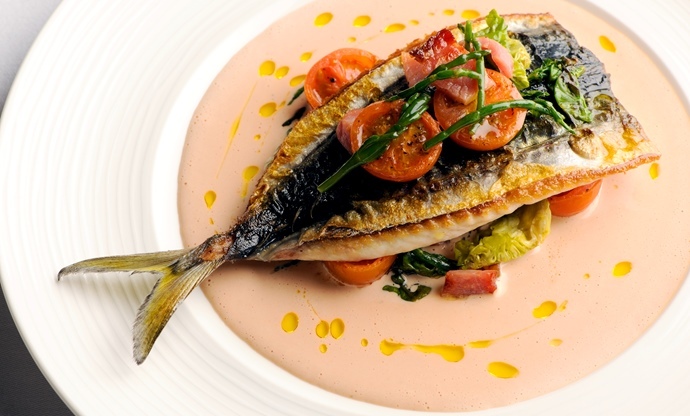 Oily fish are an important and often neglected part of our diet, so June is a fantastic month to delve into some great mackerel and tuna recipes! Read on for a couple of those, and a selection of other summer favourites. Josh Eggleton’s playful dessert combines those two fantastic summer bedfellows – strawberry and elderflower – to create something flavourful, bright and enticing. 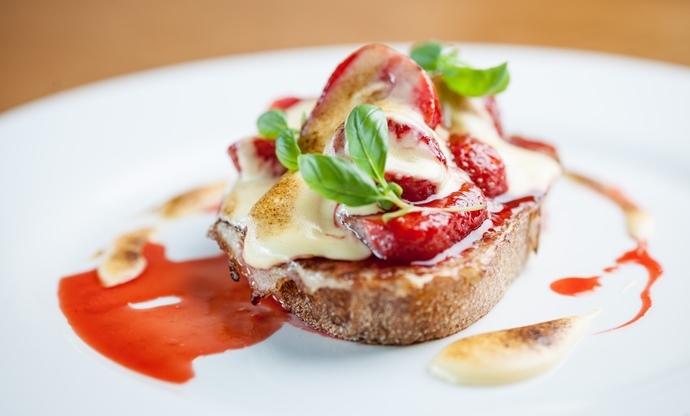 The eggy bread brings a foundation of spice and texture to the dish, allowing the other elements – a light elderflower sabayon and pan-roasted strawberries – to really shine. Pay a bit of attention to the sabayon to make sure it doesn’t scramble or split and you’ll end up with a lovely summer dessert, just as suitable for a dinner party as a casual weekday evening. There’s no denying Nathan Outlaw’s skill when it comes to fish cookery – his eponymous restaurant in Port Isaac, Cornwall, has a worldwide reputation for serving incredible fish and seafood, and Nathan is undoubtedly the man to turn to for a great fish recipe. 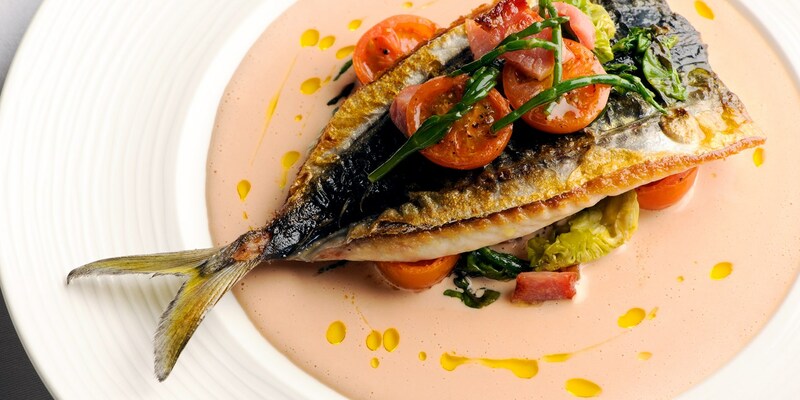 This mackerel salad may be one of his best known – it features another Outlaw hallmark in the rich-but-light mayonnaise-based tomato sauce, and he sits the pan-fried mackerel on top of a bed of cherry tomatoes, bacon, samphire, little gem lettuce and basil. After working with the legendary Peter Gordon at The Providores and Tapa Room, Anna Hansen has blossomed into one of the country's most exciting chefs since setting up on her own at The Modern Pantry. 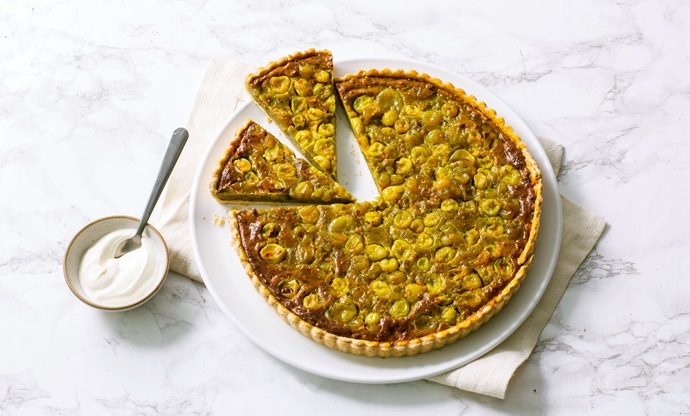 Her gooseberry frangipane tart is just another example of her exemplary palate and precision – the sharp zing of the gooseberries is mellowed by earthy turmeric and soothing honey, all wrapped up in a pistachio frangipane. 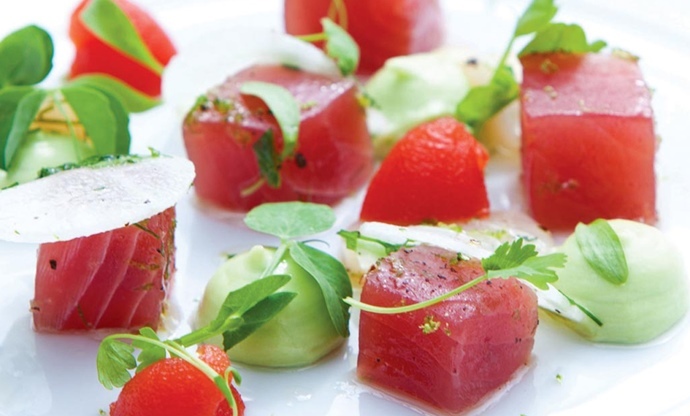 Shaun Rankin’s recipes are often designed to display incredible produce in its very best light, and this dish is no different – the fresh tuna and scallops are the stars of the show here, but they’re ably supported by thin slivers of radish, pea shoots and a boisterous Bloody Mary jelly. Shaun cooks the scallops ceviche in lime juice, and serves the raw tuna with a simple bit of seasoning and lime zest, garnishing with avocado and the Bloody Mary jelly to create something simple but very impressive. Joey O’Hare is making some of the best vegan food around right now and this dish is a beautiful encapsulation of early summer flavours. 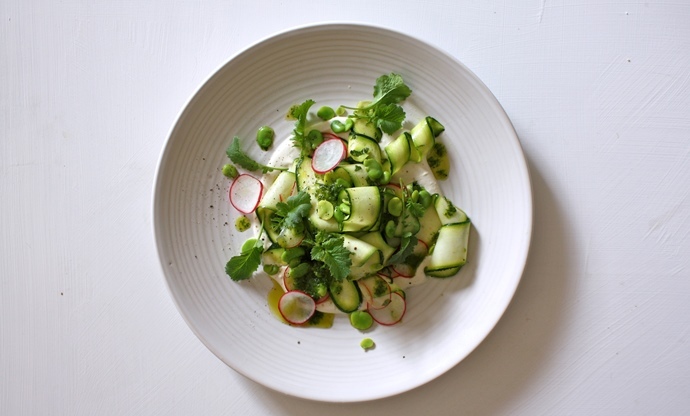 She brings together broad beans, courgettes, radishes and a salsa verde made from radish tops to create a salad full of colour and flavour, and nestles the whole thing on top of a vegan labneh, which is nothing short of genius. The labneh is made with cashew nuts, softened then blitzed with water, lemon and nutritional yeast to create a yogurt-like freshness and acidity. Clever, but also, incredibly delicious. Simon Hulstone has a reputation for complex, intricate, precise cookery at The Elephant in Torquay, and this dish is certainly a challenging one even for experienced chefs, with a lot of specialist equipment and ingredients required. Simon uses gellan gum to create a cucumber ketchup and lovage gel, he compresses his watermelon slices using a vac pac machine, and mixes his white crab meat with mayonnaise, before rolling in the lovage gel and decorating with edible flowers. Sounds tricky? 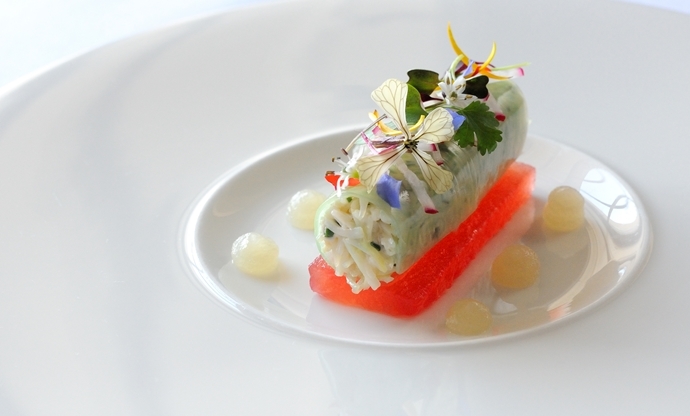 It is, but there’s the basis of a great dish here for any cook of any level – white crab and watermelon are a match made in heaven, and you can apply that any way you like. 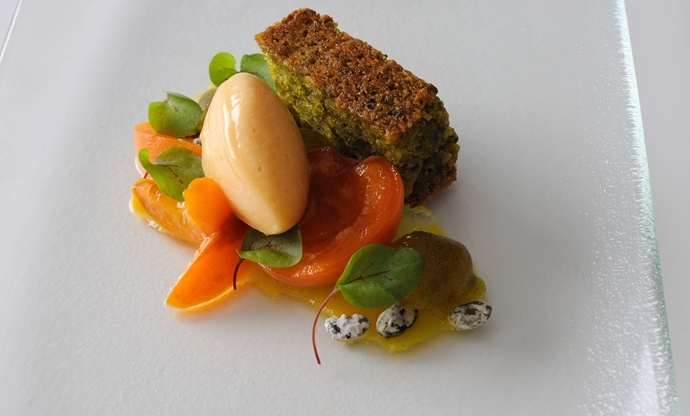 Apricot and pistachio is another tried and tested combination, one that Alan Murchison does full justice with his dessert dish. Like Simon, Alan uses a variety of high-end restaurant gear for his version, but you can easily use different methods to get the job done – the apricot sorbet can be made in an ice cream maker and the apricots can be poached gently in a pan. Some care and attention is required for the sabayon-base pistachio cake, but this is a very achievable recipe all in all, and a real showstopper to deliver at the end of a dinner party.